ZAMBOANGA CITY, Philippines (Mindanao Examiner / Mar. 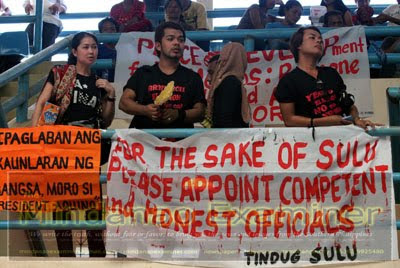 13, 2011) – Philippine lawmakers headed to Zamboanga City on Sunday where they held the last public hearing on a proposal to postpone the August elections in the five-province Muslim autonomous region in Mindanao. The House Committees on Suffrage and Electoral Reforms and Muslim Affairs have already held similar public hearings in Cotabato and Marawi cities. 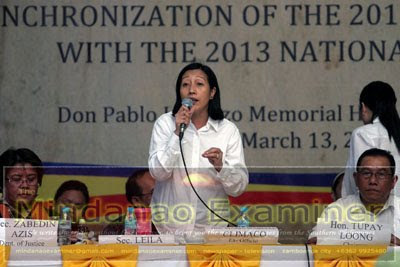 President Benigno Aquino wanted the regional polls synchronized with general elections in 2013 and appoints officials that would run the autonomous government until a new set of leaders is elected. The House Bill 4146 which was approved by the two house committees deferred the elections from August to May 2013. More than 1,000 people, mostly from Basilan, Sulu and Tawi-Tawi provinces have joined the public hearing held at the Don Pablo Memorial School. Although Zamboanga City is not part of the Muslim autonomous region, it serves as the trading center of the three neighboring provinces. The governors of the three provinces also attended the public hearing and have supported mounting calls to synchronize the elections on 2013 and for Aquino to appoint officer in charge to run the autonomous region until new leaders are elected. But some groups are also calling for elections in August so Muslims can elect their new set of officials. 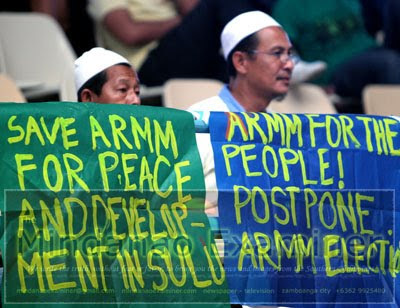 “It comes at a time that the latter’s faint hope for lasting peace are about to be rekindled when President Benigno Aquino has assumed office putting ardent trust in him that there shall be just, fair and equal playing field in the political arena,” said the Alliance of Concerned Muslims in the Autonomous Region in Muslim Mindanao. The Regional Vice Governor Reggie Generale, who is also the daughter of Tawi-Tawi Governor Sadikul Sahali, said she also wants the elections to push through.